One of the outstanding hoteliers in Ireland, Deirdre McGlone began her career in the hospitality industry at the age of thirteen, working in local hotels. Following her graduation in 1988 from University of Limerick with a degree in European Studies, Deirdre played a pivotal role in the development of the multi-award winning Harvey’s Point Hotel, Lough Eske, Donegal. Since its opening in 1989, this family owned and managed resort is synonymous with world-class hotel-keeping blended with genuine Irish hospitality. Harvey’s Point was awarded TripAdvisor No. 1 Hotel in Ireland for five consecutive years (2013 – 2017). Other awards include ‘Georgina Campbell ‘Hotel of the Year’ and the RAI Best Customer Service, Donegal, Ulster, and all Ireland in 2018. Deirdre is a board member of Donegal Tourism Ltd and has been appointed by the Government as a member of the National Tourism Leadership Group. She was nominated for both WMB and IMAGE magazine ‘Business Woman of the Year’ awards. In 2016, Deirdre was awarded the prestigious accolade ’Donegal Person of the Year’. 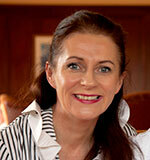 Deirdre’s is President of the Donegal Women in Business Network. She is married to her business partner, Marc Gysling.